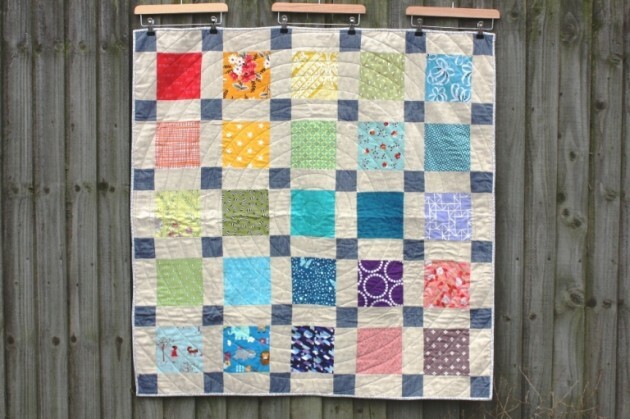 A few months ago I needed to get thinking about a new quilt. 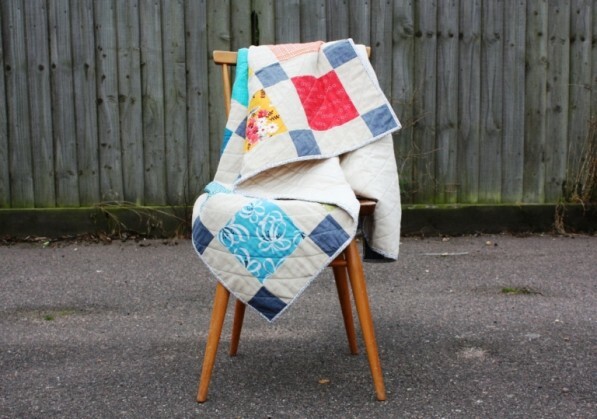 I have a very dear friend who lives in Sweden and she was expecting her first baby... a quilt must be made! 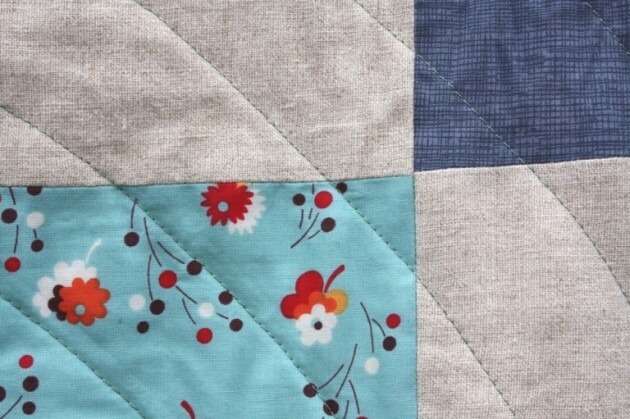 I had been eyeing up some disappearing nine patches on my Pinterest Quilts board and figured it would be a good and quick way to create a paintbox quilt. 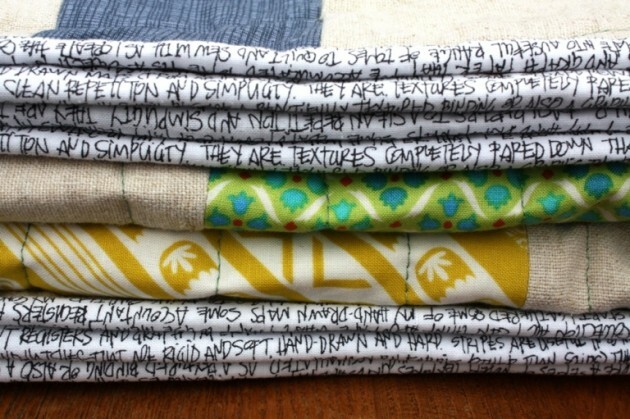 It would also be easy to make from my scraps pile (scrap packs have just gone in the shop). So, I set to one evening, and boy it was quick to sew up. I had the quilt top done in a matter of hours. I had intended to make this a cot size, but it ended up more of a lap size... my quilt maths failed me again, but hey, bigger is better than smaller I figure. Seeing as the front had so much colour with the scraps, the surrounding fabrics obviously needed to be muted to make the paintbox effect work. I used Sketch in Smoke and a Natural Linen Blend. These worked really well as the linen gave some textural interest and the sketch wasn't a flat colour either. To keep the muted theme I used Scribble Notes in Charcoal for the binding. 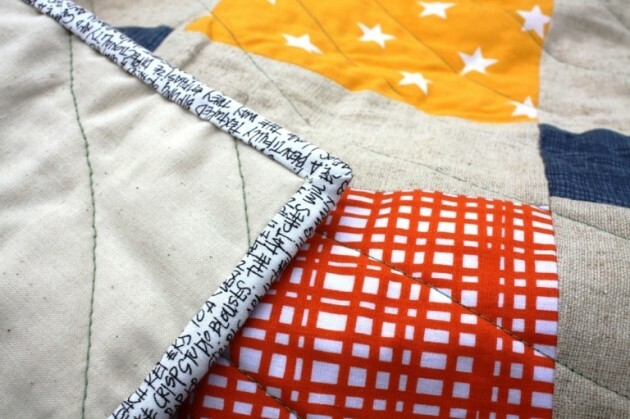 The binding is possibly my most favourite bit of the quilt, I think the writing looks fab. So, the quilt has been hurriedly snapped and sent off to Sweden and hopefully keeping that special pair warm during those night feeds.